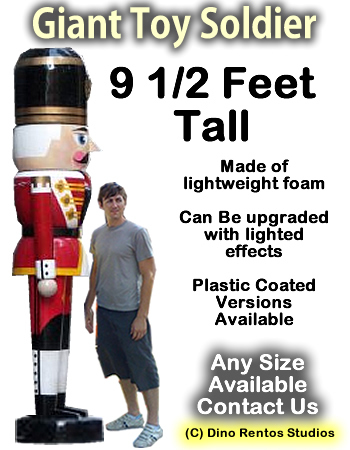 Giant Christmas Toy Soldier Foam Prop - Dino Rentos Studios, INC. Approximately 9 feet tall! Call for custom versions. This is a painted foam toy soldier. Perfect for events, retail displays, trade shows and Christmas decorations. Upgrade to plastic coated version for protection and durability. Plastic coating is ideal for long-term use. Allow 4 weeks for manufacturing. Expedite service available.